The Spring Term Promotion Exams will take place this week — Monday, May 12 through Friday, May 16. Eligible students will earn promotion to their next rank by successfully completing their promotion exam this week. The Promotion Exams will take place during normal lesson times this week. Fundamentals and Honors students should attend 2 lessons this week to complete your promotion exam — one of your “A” days (Monday and Tuesday), and one of your “B” days (Wednesday and Thursday). If you have to miss one of these days, please come to your Coaching lesson on Friday to complete your promotion exam. Tigers students should attend 1 lesson this week to complete your promotion exam. To be eligible for promotion, Fundamentals and Honors students must have earned all 3 of their achievement stripes during the Spring Term, and have a minimum of 22 Class Credits for the term. 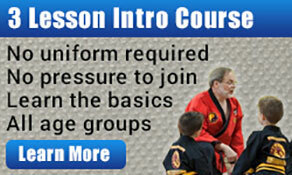 White belt students only will be eligible for promotion with a minimum of 18 Class Credits. Tigers students are eligible for promotion with a minimum of 2 Achievement Stripes, and have no class credit requirements. Please register for the Spring Term Promotion Exams at the school, if you haven’t already done so. Please check with Mr. Booker if you have any questions about whether you are eligible for the Spring Term Promotion Exams.